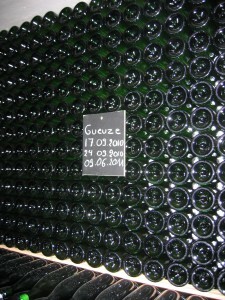 Bottles of sour beer aging at Brouwerij Cantillon in Brussels, Belgium. I’m a fan of sour beers. Last week, I posted an article addressing the biggest fear of most homebrewers contemplating brewing sour beers. However, I know that some potential sour beer brewers may also have second thoughts because of the perceived complexity of the process. They may have read that a large amount of aged hops are required, or that they must culture microbes from bottles of sour beer. They might have read that unusual or impractical fermentation vessels (carboys with table legs stuck in them or 55-gallon/210-L barrels) are required. This is not true. While some sour beer brewers go to extreme lengths to mimic traditional methods or perfect their sour creations, it is possible to brew a very nice sour beer with just a bucket, some patience and ordinary homebrewing ingredients and techniques. With that in mind, here’s my recipe for a “simple sour” — a straight lambic-esque beer that tastes great on it’s own, or can be used as a base for a fruit lambic or as a blender with other sours beers. This is a sour beer that can be made simply, but still turn out great. Wort production for this beer is very simple. The quality of the beer comes from the fermentation and aging. The malt extract will already have minerals dissolved in it, so very soft water (even distilled or RO water) will work well. In reality, almost any tap water that tastes good will work. If you have water that is very high in carbonates > 150 ppm, dilute it with some distilled or RO water to lower the carbonate level to around 100 ppm. You should either carbon filter the water or treat it with one Campden tablet the night before to eliminate chloramines. Make your wort as you normally would. (And just because this is a sour beer, don’t skimp on cleaning or sanitation — you’ll be adding the “bugs” you want.) Cool your wort to 68–72 °F and transfer it to a plastic bucket fermenter. (A carboy will work, but a bucket is a bit better because it lets in a tiny amount of oxygen.) Aerate the wort, but don’t go nuts. If you can use air instead of oxygen, do that. Pitch the blend of yeast and bacteria. Put a strip of masking tape on the fermenter and write the name of the beer and the date you brewed it. For the first week, hold the fermentation within the typical temperature range for ales (68–72 °F). During this time, the brewers yeast in the sour mix will ferment the wort. Next, place the bucket somewhere at room temperature or above. Your best choice is to put it somewhere in your house that heats up a bit in the summer (up to 85 °F). In fact, exposing the beer to some heat (75–80 °F) in the first month or two after the primary fermentation is done will help the souring organisms. (Think about putting the bucket in a garage or near an outside wall in a room that the air-conditioner doesn’t cool well.) Now, leave it for one to three years. Yes, you read that right. The bacteria that sour the beer work slowly. Give them at least a year to do their thing before you either bottle the beer or add fruit. Make your wort as you normally would. (And just because this is a sour beer, don’t skimp on cleaning or sanitation — you’ll be adding the “bugs” you want.) Cool your wort to 20–22 °C and transfer it to a plastic bucket fermenter. Aerate the wort, but don’t go nuts. If you can use air instead of oxygen, do that. Pitch the blend of yeast and bacteria. Put a strip of masking tape on the fermenter and write the name of the beer and the date you brewed it. For the first week, hold the fermentation within the typical temperature range for ales (20–22 °C). During this time, the brewers yeast in the sour mix will ferment the wort. Next, place the bucket somewhere at room temperature or above. Your best choice is to put it somewhere in your house that heats up a bit in the summer (up to 29 °C). In fact, exposing the beer to some heat (24–27 °C) in the first month or two after the primary fermentation is done will help the souring organisms. (Think about putting the bucket in a garage or near an outside wall in a room that the air-conditioner doesn’t cool well.) Now, leave it for one to three years. Yes, you read that right. The bacteria that sour the beer work slowly. Give them at least a year to do their thing before you either bottle the beer or add fruit. Question…what about yeast auto lysis, shouldn’t the beer be racked off the primary yeast before letting the long secondary get going? For a sour beer, no. When yeast die, they provides nutrients for the bacteria. I’ve had good luck making sour beers in buckets. I’ve brewed many from a recipe very similar to this (except I made the wort all-grain). I once blended a 3-year old sour beer from a bucket, a 2-year old beer from a bucket and a 1-year old beer from a bucket to make a gueuze-style beer that won Best of Show at my club’s competition. Joe Walton and I also made a sour beer based on the Hymn to Ninkasi poem that was aged in a bucket for a year. It was Second Runner Up the year we entered it. When aging sour beer in a bucket, make sure the lid actually seals (sometimes I wrap the seal in duct tape, as an added measure) and keep the water in the airlock topped up. If you do this, you should be fine. I am going to do this in the next few weeks. I have a vial each of WLP sour mix and Flanders ale coming over from the States. I am thinking of adding 5% each of carahell and flaked oats. Right now we have ambient temperatures in the low 20s C for fluid(as we are in winter) but summer will up that by 10C or so. I have been waiting to get the chance to do this for sooooooooooooo long. Great! Once you start brewing sours, you’ll be hooked. I’ve read on different sour beer recipes that a big part of the flavour is aging the beer in oak barrels. If I don’t have access to an oak barrel, what do you know about adding oak chips to the carbouy? A lot of sour beers are aged in oak barrels. However, these are — in every case I can think of — used or “neutral” oak barrels. They don’t contribute oaky, vanilla-like notes to sour beer as new oak barrels do to red wine. The beer in a barrel can “breathe” a bit because the wood is lets in a tiny amount of oxygen over time, and this may stimulate the souring microorganisms. I forgot to use the yeast nutrient. Is it doomed? Or will I still be okay? It will be fine. The yeast nutrient would get gobbled up by the brewers yeast early on. If your primary fermentation went fine, then you have no worries. Just let the beer sit and sour. Check on the airlock occasionally, as the water can evaporate over time. I used this technique last September and pitched the Wyeast Roselaere blend. It is coming along nicely, tasted it last night and the gravity has dropped to 1.006. When it comes times to bottling, is there anything special that needs to be done (in particular, a yeast addition)? I assume the bacteria will eat the priming sugar, but was not sure how long that would take. Thanks. When in the process would you add fruit? Let the base beer ferment and sour — at least six months, but preferably a year — then add the fruit. I have made several attempts with sours in a bucket and they tasted like plastic. DO NOT AGE IN PLASTIC. what’t the mash temp for all grain?